Swimming with dolphins is for babies. Grown-ups swim with SHARKS. And not while safely enclosed in a wire cage, either. Wire cages are for babies. Grown-ups swim with sharks in the OPEN WATER. 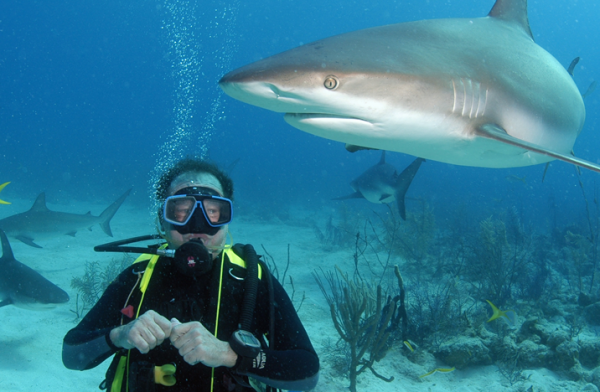 If you are a grown-up, you'll do well to fly to Long Island in the Bahamas, where you can sign up to descend 30 feet into the water and watch sharks being fed in their natural habitat. So how do you make it out of this activity with all your limbs? The idea is that the sharks are eating the chum being given to them, so they won't eat you. Foolproof, right? Just don't sue me if you try out this activity and get ripped to shreds. I am only the messenger. You're the person who let a blog goad you into swimming with freakin' sharks.